Harbison genealogy: William Harbison and his siblings; the late 18th century. William Harbison and his siblings; the late 18th century. This is my best current list of William's siblings. It's pretty speculative. John, as we've seen, is clearly William's brother. John appears as godfather for James, Sampson's son, and Sampson is connected to Henry as we've aready discussed. 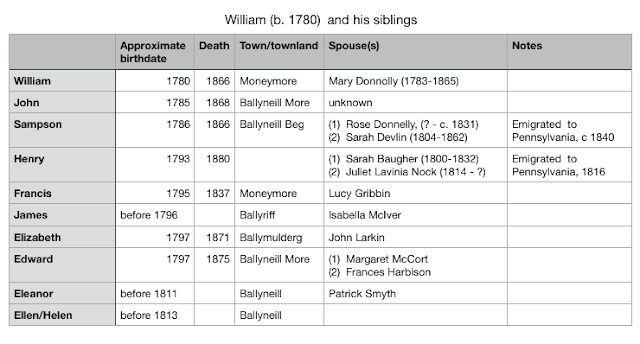 Francis lived in Moneymore, in close proximity to William, and cowitnessed a marriage with Mary Donnolly in Moneymore. The rest are more speculative. Elizabeth married John Larkin, with a child (John) christened in Moneymore in 1829, Elena as godmother. The town listing is Ballyneill, but that was likely her residence, not his. Problem is the register entry is Latin, so Elena could be Ellen or Helen. We have what may be Elizabeth's death certificate from the adjacent townland of Ballymulderg in 1871, aged 74, putting her birth in 1797. There is a listing for a John Larkin in Ballymulderg in the 1831 census, with two sons and two daughters. There's also a listing for a John Larkin in Ballyneill, but he has no sons and two daughters. Baby John might of course have died in infancy. James seems to have settled in Ballyriff, adjacent to Ballyneill Beg. The 1831 census lists 1 male and 6 feamles; proably five daughters. We also have a christening record for his children Bridget (likely one of the five) in 1828; and John (b. 1833; and a death record for his daughter Jane. His son James apparently took over the farm and appears as an aged widower in the 1901 census. Edward appears in the 1831 census living in close proximity to John. He married Margaret McCort, and had a child Elena (see above) in 1829, Henry in 1833, and Mary in 1838. Margaret must have died by 1850 (probably a famine death) since he remarried a Frances Harbison in the Church of Ireland in 1850. More on this later. He died in 1875. Eleanor was godmother to a child in Ballinderry in 1827, and married Patrick Smyth in 1833. They may have emigrated; I can find no further record of either of them. Since one had to be 16 to godparent, that puts her birthdate in 1811 or before. Finally, similarly, Ellen/Helen, by the same reasoning, must have been born before 1813. Putting too much reliance on reported years of birth is a mistake, but Elizabeth and Edward could certainly have been twins. We have no direct evidence of any sibling born after 1797, but either Eleanor or Ellen/helen could have been. But certainly, it's at least plausible all of these births could have occurred betwen 1780 and 1800-1805, which would have been consistent with the father being the John Harbison reported in Ballyneill in the 1766 religious census. If John had been born circa 1745, he might have been the brother of James Harbison of Donaghenry. His last child would then have been born at age 55 - 60, which gives us a bit of leeway. His wife (unknown) may have been considerably younger, cf course, likely born about 1760. In favor of this hypothesis are the names, which form a pretty complete slate of the common Harbison names at the time -- we have no duplicate names in the list of plausible siblings. Sampson remains a mystery, but we can speculate he might have been christened Samuel and adopted Sampson because he was unusually strong, for example. ... is a millennial atheist libertarian feminist scientist, trapped in the body of a much older man. Help me! This blog obviously doesn't represent the views of my employer; it's way too cool.